Number Picker component is available from API 11. But generally, we make the application that target from API 8 (Froyo). So, how can we display/use the number picker component, while the target range from API 8 to API 16 (current version). One of the methods that we can use is to create a similar component, by utilizing existing component. A Number Picker component consist of two buttons and one view / textview component. First button is to decrement/ get previous value from value array. Second button is to increment the value / get next value from value array. And lastly, textview componet to display the current selected value. 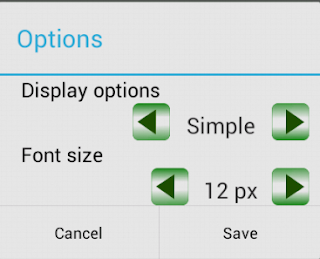 Three existing components (2 buttons, 1 textview), can be wrapped together in a viewgroup component like LinearLayout. and we can make a method to handle for clicking/touching the button. As the title said, the class we defined can be use also as a Text Picker (Spinner substitution). While spinner show a dialog when fetching new value, this component can show directly without using new dialog to show the choice items. ok, Have a nice try! Learning with sample code ?